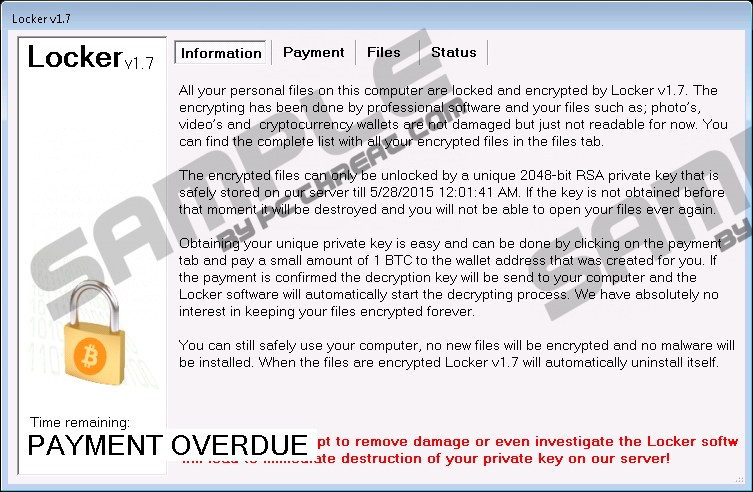 The name of Locker Virus gives away that it is a ransomware. This malicious threat uses file decryption as a leverage to get your money, and even though this threat does not ask for an incredibly large ransom, paying it is not something that you should take lightly. There is a great possibility that you will lose your money, and Locker Virus will remain locked if you pay the ransom. Unfortunately, some users rush into this without even thinking much about it. At the end of the day, it is most important that you successfully remove Locker Virus, and we can show you how to do that. According to our research, Locker Virus is very similar to Tox Ransomware, Alpha Crypt, and other infamous Cryptolockers. Even though it is most likely that all of these programs were created by different parties, they all serve the same purpose. Unfortunately, the most disturbing feature that these threats share is the ability to encrypt your personal files. Even successful removal of Locker Virus or its clones cannot decrypt personal files. This is the main reason why many computer users pay the requested ransom before they delete Locker Virus. As mentioned before, even if you pay the 1BTC (~$240) ransom, your files might remain locked. However, most users do not see any other option. In an ideal situation, you will have your most valuable files backed up, in which case, you should delete Locker Virus without further postponement. If this is the case, scroll down to the removal guide below that will help you remove Locker Virus from your Windows operating system in no time. If you do not have copies of the files encrypted by this malicious threat, the immediate removal of Locker Virus might not seem like an ideal option. Even though it is possible that you would be sent a decryption key that you could use to decrypt your personal files after you pay the ransom, you must recognize the risks associated with this. Even though the removal of Locker Virus cannot solve the encryption of your files, you might be able to find a different solution. After all, our malware research team does not recommend contacting cyber criminals or fulfilling their demands. If you choose to act against our advice, do so at your own risk. Regardless of your decision, make sure that you delete Locker Virus from your operating system. Our research has shown that Locker Virus can enter your operating system using corrupted spam email attachments, or it could be introduced to you via dangerous websites. All in all, if you need to delete Locker Virus from your operating system, it is obvious that your virtual security is vulnerable. Even though some users might be experienced enough to remove Locker Virus manually, it is a good idea to install automatic malware removal software that would not only delete this devious ransomware, but would also ensure that your operating system is protected against other dangerous threats that might attack you in the near future. Download an automatic malware removal tool, SpyHunter. Install the program and initiate a full system scan. Allow the tool to delete Locker Virus. Quick & tested solution for Locker Virus removal.